In 1999 I began building guitars with the hope that I would learn to build instruments that were deeply appreciated by the finest of musicians. I’ve experimented with every aspect of the guitar’s design, from the aesthetic appeal and physical structure, to the function of producing fine tonal character. My goals have always been to better understand how the guitar works, to understand what guitar players want, and to make sure that I developed guitars that fit their needs. I believe that every instrument I design is spiritual being that has an ability to connect with a musician in a very special way. I strive to find that connection in all of my work. Our new line of guitars are the product of all of my work and experimentation over the last 12 years! The instruments that we are now producing are a compilation of the best of my ideas and understanding of the guitar’s function. These are great guitars with great designs that are like no other guitar you have seen before. The body shapes are fresh and bold, easily recognized by the serpentine lines and tight waist. The comfort level of these instruments is unmatched by traditional body shapes. The elegant shapes of Cybele, Eos, and Freya lend a notably different tonal character and an aesthetic appeal that sets apart every Andrew White Guitar. 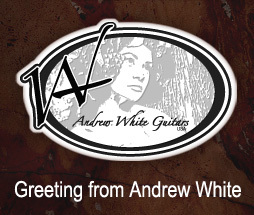 Thank you again for visiting our website and I hope you enjoy the newest line of Andrew White Guitars. Check back with us soon to find the latest designs that I am already working on. If you like these guitars, you will love what we will have in the future! It is an amazing time for Andrew White Guitars and I am so happy that you are a part of it. « Prev Andrew White guitars are dedicated to 12 G-shin(=god) show.